Tyson isn’t ignoring creationism. Creationists wish Tyson were ignoring creationism. 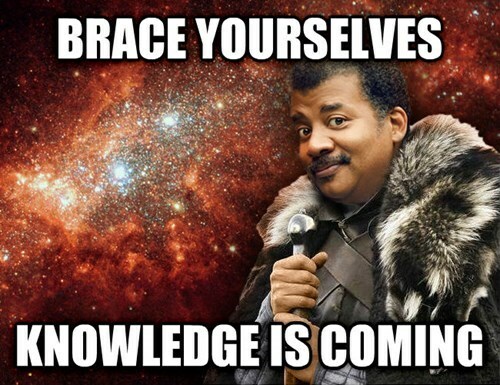 Tyson is instead standing on creationism’s home turf and playing by their rules. […] Tyson is taking creationists’ claims deadly seriously, and showing all the ways they’re wrong. We’re fortunate here in Australia that we don’t have so such a deep culture-war gulf on the issue of planetary and biological origins as part of general science education. I for one don’t take that for granted though. Cosmos is currently showing on the National Geographic pay-tv channel here in Australia. I hope it gets picked up by SBS or Auntie once pay-tv has done with it. ‹ Menopause – is it all down to the blokes? I love that picture. I hope this goes free to air as well. I would love to see it, and the more of this type of thing I can expose my kids to the better. I’m sure it will be out on DVD within a few months, and it’s after that when the free-to-air rights will be available. Might be good to add the DVD to the maybe-for-xmas list?